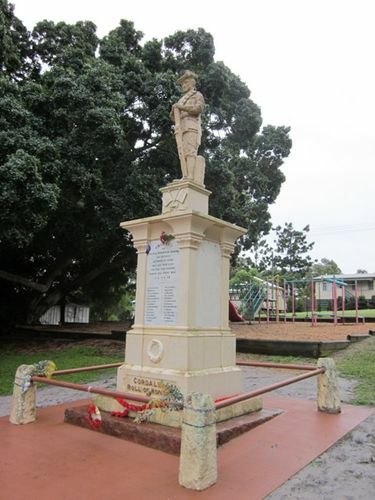 Cordalba War Memorial was erected in memory of those from Cordalba District who died in service or were killed in action during World War One. The original 'digger' statue was vandalised and replaced by an obelisk. The memorial has been restored and a replica of the original statue has been placed on the memorial. The unveiling ceremony in connection with the Soldiers Memorial took place this afternoon. Proceedings were started by the Apple Tree Creek Band marching down Queen Street followed by about sixteen returned "Diggers" under the command of Lieut. G. Mathers, to the Memorial ground, where they stood to attention. The Chairman ( Mr.W.Richmond), called upon the band to open proceedings by playing the hymn " Lead Kindly Light." Prayer was given by Rev A.E. Arkin.